I previously reviewed the Beard oil from Nordman, a brand that embraces the viking spirit and then I was sent throughthe Nordman ‘Freyja’ Beard Mist that can be bought separately or available as part of the Nordman Beard Care package. I was a little perplexed as at first about the beard mist, its distilled water with a blend of essentials oils including, Cedarwood, Sandalwood and Rosewood and I hadn’t actually come across anything like this before. I throw my hands up in the air and admit that I thought this was a product that I would never have any use for, however I was wrong, very wrong! The idea behind this mist is actually very well thought out, we oil our beards in the morning and its a great feeling, our beard is tidy, it smells great (if you have a good oil) and it feels fresh, however its now several hours since you groomed your beard and you need a freshen up, so you spray some of this mist onto your beard and give it a run through with the comb and it feels very good. However don’t think this is just for your beard, this would be a great freshen up fro your face or if you are like me and have a grade one or a bald head, it feels good on there as well. I am testing and reviewing a lot of beard products lately and so I don’t get the chance to go back and use an oil again, I have my favourites but I need to move on and test the next oil or balm and so it was nice to be able to go back and use the ‘Odin’ Beard oil from Nordman again as part of this test of the mist. I would highly recommended giving this mist a try, it would be a great product if you are working outside in all weathers and it would also be a great way to freshen up after you have eaten something and had to wipe the remains of your food out of your beard. It would be also extremely worth using on a long haul flight. 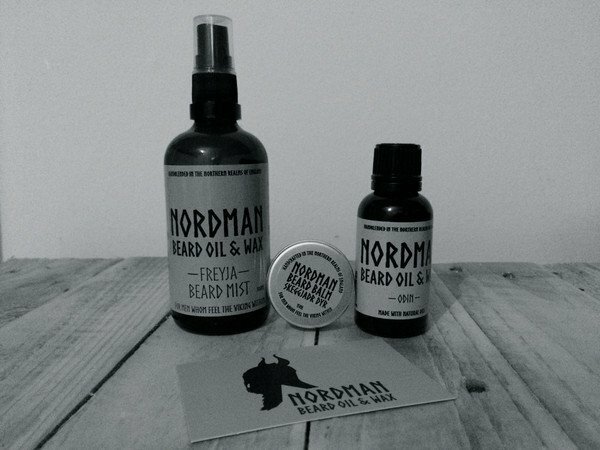 So pop on over and have a look at the Nordman website and grab yourself the perfect way to freshen up that beard.